It might be cliche, but everyone loves to defy TLC and “go chasin’ waterfalls”. I think waterfall hikes are some of the best because they are still beautiful in the rain and snow, so you can hike to them all year. There are a few well known waterfalls near Vancouver you can hike to (ahem Shannon Falls and Brandywine Falls.) But if you look a little further out, you’ll find tons more waterfall hikes. I put my thinking cap on and came up with a list of over 40! There’s something for everyone on this list from short and easy hikes to reeeeeally long and difficult ones. And the waterfall hikes are spread out from Pemberton and Whistler in the north to Hope and Manning Park in the east. So here it is, my really big list of waterfalls near Vancouver you can hike to. Heads up: These trails are located in sensitive wilderness areas. Learn how to Leave No Trace before you go so we can all keep the wilderness wild. A quick note on safety before we start. As with any other hike, you’ll need to carry the 10 essentials and leave a trip plan. But it’s also worth noting that waterfall hikes tend to be more dangerous than other hikes since they usually involve steep drop offs and slippery surfaces. Rocks, logs and ice can crash down without warning, so be careful when exploring the bottom of waterfalls. Several of the hikes on this list have claimed lives or seriously injured hikers. It can be really tempting to jump over railings, clamber down cliff faces or walk across wet rocks trying to get a better view of the falls. But please don’t. Stay on the trail. Your life could depend on it. This loop hike travels around the canyon of Cypress Creek in West Vancouver, passing several spectacular waterfalls and viewpoints over the steep canyon walls. Many people head to Lynn Canyon to see the suspension bridge. But if you head downstream you can check out Twin Falls as well as several smaller falls in the canyon. Ok, so the spillway from Cleveland Dam is a man-made waterfall, not a natural one. But it’s still pretty spectacular. Be sure to take in the views from both the top of the dam and the bottom. The hike to Norvan Falls follows Lynn Creek upstream along a long-abandoned logging road. After a few hours, the trail turns uphill along Norvan Creek to the falls. You can hike to Kennedy Falls via a rugged trail on the less-travelled west bank of Lynn Creek. Along the way you’ll pass by a massive old cedar tree. Did you know there’s a hidden little trail network in Lions Bay? The low elevation trails have great views of Howe Sound. The highlight is pretty Crystal Falls. If you complete the challenging Howe Sound Crest Trail that runs from Cypress Mountain to Porteau Cove, you’ll be treated to two waterfalls along the way. Both falls are in the northern section of the trail. You can find Phi Alpha Falls on the descent from Deeks Lake towards Porteau Cove. Hannover Falls is located between Brunswick and Hannover Lakes. Yes, there are two waterfalls near Vancouver called Crystal Falls! The Crystal Falls in Coquitlam is located along the Coquitlam River and is an easy and flattish hike. If you’ve hiked around Buntzen Lake, you might have spotted a waterfall tumbling down from the mountains on the east side of the lake. That’s Swan Falls and you can hike there via the powerline trail. 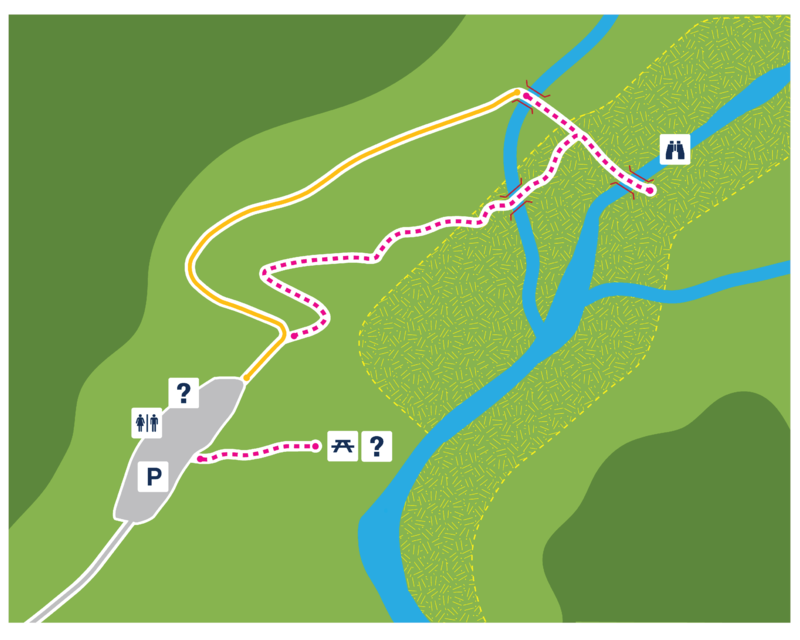 The easy trails in Maple Ridge’s Cliff Park are perfect for families or days when you want a shorter walk. There are a few places to view the falls and canyon, plus a big picnic area for snack breaks. Also known as Lower Falls, the hike to Gold Creek Falls is one of the most popular hikes in Golden Ears Provincial Park. The well-travelled trail ends up at two viewpoints: one at the bottom of the falls and one at the top. The top viewpoint can have lots of spray in the spring, so bring a rain jacket, even on a sunny day. This hike is a bit different than the others on the list: To get to the trailhead, you have to paddle a canoe! Widgeon Falls are thunderously powerful in the spring. In the summer they dry up a bit, exposing some cool rock pools you can cool off in. Many visitors to Rolley Lake don’t realize that there are actually two waterfalls at the lake. The official park trail goes to the smaller, upper falls. But if you continue downhill on a fainter trail, you’ll discover an even taller falls. The trail to Steelhead Falls branches off the much longer trail around Hayward Lake in Mission. You could spend a full day walking around Hayward Lake, but the trip to Steelhead Falls takes less than hour. You’ll descend down wooden steps to a viewing platform. The Davis Lake area around Mission is popular with 4-wheel drive people, which means many hikers might not have heard of it. There’s a great little waterfall near the lake outlet that makes a great place to cool off on a hot day. More Info: There’s not a lot of info online about these falls. Pick up the Backroad Mapbook: Vancouver, Coast and Mountains for help finding them. It’s a long drive on logging roads to reach this off-the-beaten-track trail, but there are two huge waterfalls to enjoy. Statlu Falls is the first one, just below the outlet for beautiful Statlu Lake. Partway along the lake you’ll find Brotherhood falls, cascading through a canyon. Stay well back from the edge when exploring Statlu Falls as it has claimed several lives. Photo Credit: “This is Bridal Falls” by Cameron Wears on Flickr. Used under CC BY-NC 2.0. Bridal Veil Falls is one of the most well known waterfalls near Vancouver. It’s located right next to highway 1 and is a short and easy walk. That makes it a great place to stop and stretch your legs on a road trip. If you take on the steep and tough hike to Mount MacFarlane in the Fraser Valley, you’ll pass by two sets of waterfalls along the way. If you don’t want to push all the way to the peak, stop at Upper Pierce Lake. More Info: Pick up a copy of 103 Hikes in Southwestern BC for the best directions. This waterfall along Chilliwack Lake Road is a bit hidden, but if you find the trailhead, you’re in for a treat. There are two viewpoints, but the upper falls are more spectacular. Be sure to scramble up the steep and slippery trail to see them. These spectacular falls are over 300m tall as they tumble down the cliff towards the valley. The short hike to Flood Falls is just off highway 1 outside of Hope, so it makes a great stop-over. These three waterfalls are located along the Three Falls trail in Manning Park. Shadow Falls is a bit difficult to see from the trail, but 70m Nepopekum Falls is spectacular. The trail ends at Derek Falls, deep in a rocky canyon. It’s pretty in the summer, but it’s also gorgeous in the winter as a snowshoe hike. At 335m tall, Shannon Falls is the 3rd highest waterfall in BC and one of the most well known waterfalls near Vancouver. It’s a really short walk to view the falls, so its a popular stop on the drive between Vancouver and Whistler. There’s more to Shannon Falls than what you can see from near the parking lot. High up the slope you’ll find Upper Shannon Falls. This waterfall is located along the Sea to Summit Trail that heads up to the top of the Sea to Sky Gondola. The trail network above the Sea to Sky Gondola has some real gems, but my favourite is Al’s Habrich Trail. You’ll find the Neverland Loop branching off from that trail, which leads to gorgeous Neverland Falls. These falls along Monmouth Creek are sometimes called Echo Falls since the creek flows out of Echo Lake. This hike is right next to downtown Squamish, but since its across the Squamish River, you’ll need to boat across to get to the trailhead. The trail climbs VERY steeply next to the creek to Echo Lake. Along the way, you’ll get spectacular views of strange rock formations and waterfalls. This unique waterfall consists of two tiers offset from each other. That’s why it’s “crooked”. Try to visit in the spring at the height of the snowmelt to see the falls at full flow. This 70 meter tall waterfall is one of BC’s most popular falls. It’s an easy and flat walk from a parking lot next to highway 99, so it’s a popular stop for tourists and roadtrippers. In the winter, you can snowshoe the trail. This gorgeous waterfalls requires next to no walking. You can pretty much see it from the parking lot. But it’s definitely worth getting out of the car and heading over to the viewing platform for a better look. In the winter, you can snowshoe to the base of Alexander Falls and see it covered in ice. Pretty little Rainbow Falls is located along the trail to Rainbow Lake in Whistler. You can just make the short trip to the falls if a full day outing to the lake is not your thing. It also makes a good winter snowshoe destination. These short falls tumble through a granite gorge, carving out interesting curves in the rocks. There are two viewing platforms so you can see the falls from a few different angles. Nairn Falls also makes a great winter snowshoe hike. This off-the-beaten-track hike climbs up one side of Cool Creek canyon, then down the other. Along the way you’ll pass by rushing white water and several waterfalls. This remote trail climbs very steeply up to the Place Glacier. The trail follows Place Creek which tumbles downhill, forming Bridal Veil Cascade in a deep chasm. The trail to Joffre Lakes was re-routed a few years ago. The old trail between the 2nd and 3rd lakes was nothing too special. But the new trail passes by beautiful Holloway Falls that cascades downhill on a set of rock steps. How many of these waterfalls near Vancouver have you hiked to? Which was your favourite? Tell me in the comments. We definitely love chasing waterfalls too. Great list! Wow! That’s a fantastic guide! I am totally inspired to go find all the waterfalls near Sydney! What a cool mission – to explore all the waterfalls in an area. Wish we had more mountains :)! Wow I had no idea there were so many waterfalls. All the more reason to come back to this amazing place! !